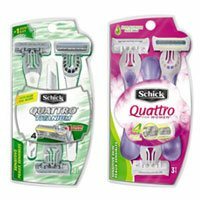 Our Schick Quattro Sensitive disposable razor cartridge features four blades, lubricating strip and pivoting head to deliver a smooth shave - no matter where you go. Plus, each disposable razor cartridge includes a special edging blade for added precision. Schick is one of the only brands that do not break me out.